Compromise, compromise. – Dirty wet dog , boats and sailing. Now that i have got caravans off my chest (heavy man) and i have had a good old rant about the international offshore rule boats i thought i would try and find a compromise point where the boat is a lot better than arnold sideways in sailing qualities but that would still make a potentially comfortable cruising boat. This week i found and took an interest in the plywood Waarschip as being about the right size for a minimum cruising boat that i would want to take across the channel, couldn’t get to see the boat due to an ongoing back problem but did have a hunt around for anything similar to that boat in common production boats. At the same time i did the initial work for a potential project with a boat of about that size, with the Waarschip for example i started to cost up a project of altering the keel to a shallow draught version with a heavy plate, bulb or bottom shoe to keep the stability. Something i noticed with the Waarschip is that the shallower keel versions do have a bulb/bulge and they sweep back quite a bit and that reminded me of a similar sized boat down at the yard. I will try to hunt out some better photographs : apparently i have just missed the very nice example at the yard just going back in the water !…..for those that don’t recognise this boat its the Sadler 25 and again a bit of a breakthrough design in its day from David Sadler who famously designed the Contessa 26 which is based on the Folkboat, compared to that the Sadler 25 is a huge breakaway with its fin keel and spade rudder, firm bilges , tumblehome and much greater beam. By all accounts it was a successful boat and right now there are at least 8 on various brokerages from about £3k up to £8 k. I have just been sent the survey report on one…frustratingly up in Glasgow but realistically that is closer than N Wales as i could fly up and back in a day from nearby Exeter. Everyone will see the instant problem ie that its a fin keel, the draught as standard is 3 foot 10 so its immediately more limiting than the Liberty although that is about the same sailing draught with the board down…obviously i couldn’t then lift the Sadler’s keel so i need to consider a compromise. Taking inspiration from the keel shape on the Waarschip i wondered if it would be possible to take a small amount of depth off the bottom of the Sadler’s keel and then replace that weight with first a wider and welded on steel bottom plate and then build a bulge above that but faired nicely, maybe with some short steel webs welded to the original keel and the new shoe plate. Building up a bulge would be with lead shot and epoxy BTW. The price is about right for a project boat, the engine looks recent and the interior looks ok..can’t do much with the layout on these as they have an internal moulding. I might pop down and see this one. Alan writes : “Whats the keel made of? I would at a guess say cast iron and if it is there’s no way I would weld anything to it. Just not a reliable process. if its a steel fabrication filled with ? again problem once you open it up. Is it lead ? Other consideration is keel bolt / structure load with a shorter heavier keel. Me….good thought, i didn’t know that. Alan writes : The hull is probably strong enough to handle all the keel variations. However if you slip the boat the two shoal draft versions will support the boat fore and aft and avoid a point load toward the rear of the keel. 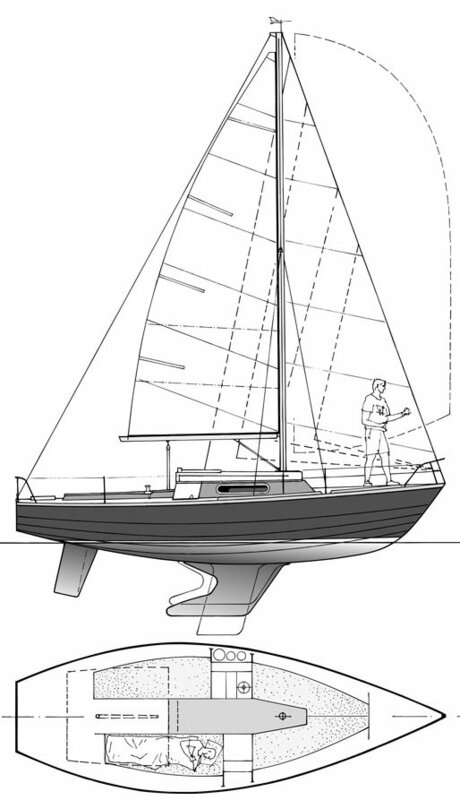 The fore and aft C of G could even be aft of the rear of the fin keel. Obviously the fin keel version would need to be very well supported on the hard. Nina reckons that if you sort out a design in Alloy that will fit in a 40 ft shipping container she will weld you one up. You can get a kit cut out by here. We get aluminium at a good price. Me : ‘honey would you get my gun’ ! Previous Things i didn’t do (this week). Whats the keel made of? I would at a guess say cast iron and if it is there’s no way I would weld anything to it. Just not a reliable process. if its a steel fabrication filled with ? again problem once you open it up. Is it lead ? New keel is the only way I would go. That’s where my technical knowledge breaks down : last night i was thinking “can you do that” ie weld plate to what i presume is a cast iron keel ?. Ok so i guess not !. I’m not sure that the keels on the low draught version of the little Waarschip are any heavier as the boats seem to run at the same waterline. Thanks…..that at least answers one tech problem ie do it properly because the keel is rather useful. I just noticed something really interesting when i went back to the drawings of the Waasrschip ie that the keels also have different lengths of attachment at the hulll with the bulb/bulge keels all having a larger attachment area at the hull/keel point. I wonder if they did that so that more of the hull is supported when the boat sits on its keel. The hull is probably strong enough to handle all the keel variations. However if you slip the boat the two shoal draft versions will support the boat fore and aft and avoid a point load toward the rear of the keel. The fore and aft C of G could even be aft of the rear of the fin keel. Obviously the fin keel version would need to be very well supported on the hard.